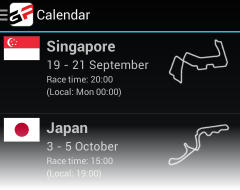 Including all session times (in your local timezone), a countdown to the next session and configurable reminders for each race. Automatically updated results and championship standings after each session. Drill down into individual driver and team results. 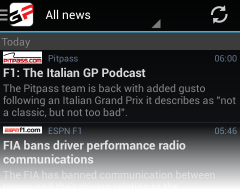 Up to date information from popular Formula 1 news sites. 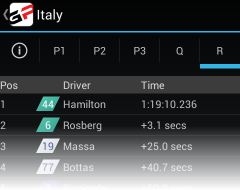 This app/website is unofficial and is not associated in any way with the Formula One group of companies. F1, FORMULA ONE, FORMULA 1, FIA FORMULA ONE WORLD CHAMPIONSHIP, GRAND PRIX and related marks are trade marks of Formula One Licensing B.V.